Hello! Thanksgiving is over and everyone is safely home. Hope all was well with your holiday and that you had lots of yummy food and desserts to keep you full. We had lots of desserts. Because desserts. . . well, they taste good. 5 desserts to be exact. We should have had 7 desserts. But I was feeling lazy. I'm going to tell you about them ALL. In two posts. . . I won't bore you all in one day. Today I'm going to tell you about everyone's favorite dessert. I try to make it every year. Some people have told me that it is their favorite cheesecake. In the history of cheesecakes. It's in my top 3. And I've made lots of cheesecakes. 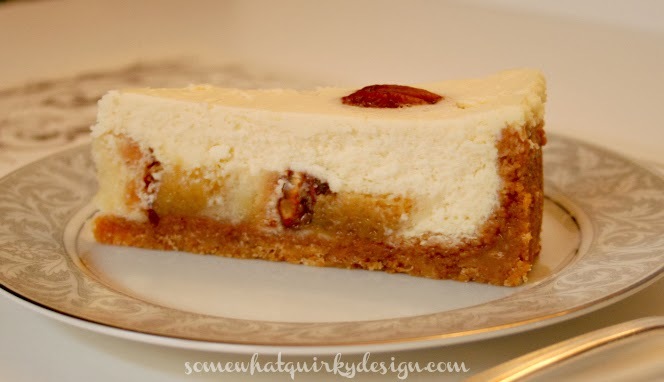 *note: after years of making this and thinking "I need to add more cheesecake to this" I have come to the expert opinion that the recipe needs to be increased by half. The measurements for that are here in red. It tastes better this way, and almost as important, it looks better. Thaw pecan pie according to package directions. 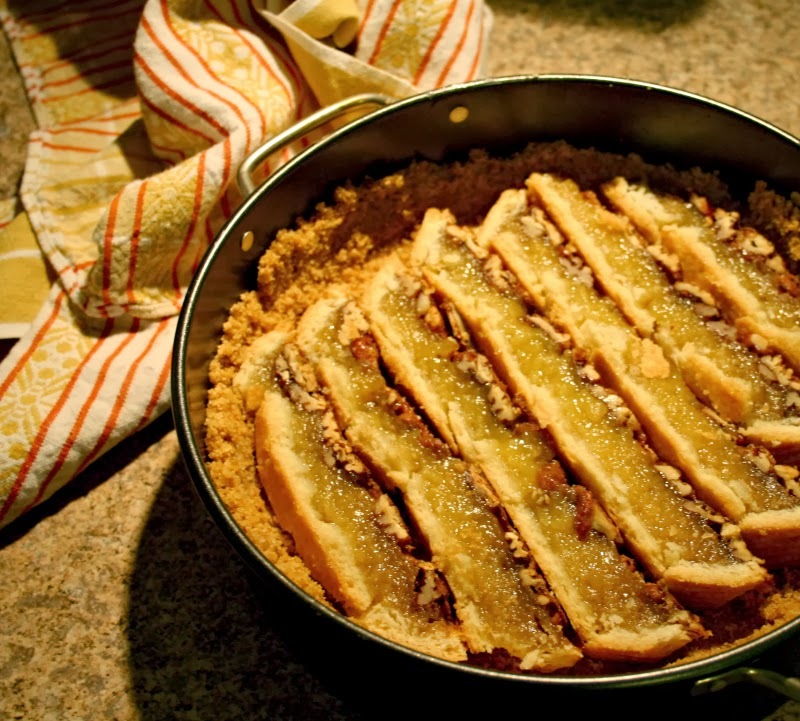 Cut pie into horizontal slices about ½ inch thick - or less; set aside. *this year (2017) I made this with my own pecan pie recipe rather than buying one. The results were outstanding. Everyone was in agreement that it was the best the cheesecake had ever tasted. The only difference I made in the recipe was to use chopped pecans on the top rather than the whole pecans I usually use. It made it much easier to cut (and eat) the cheesecake. Stir together cracker crumbs and next 3 ingredients; press mixture onto bottom and 1 ½ inches up sides of a 10-inch springform pan. 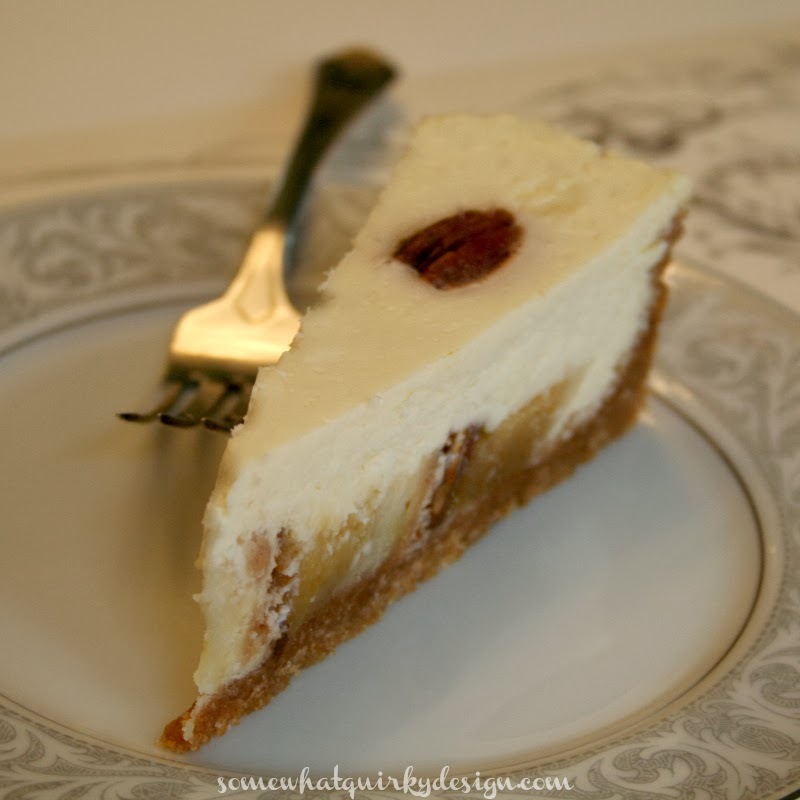 Arrange slices of pie across the crust – covering the entire crust. Use the rest of the pie however you like. Beat cream cheese until smooth; add eggs, 1 at a time, beating after each addition. Add sour cream, half & half, and vanilla; beat until blended. Fold in powdered sugar and flour. 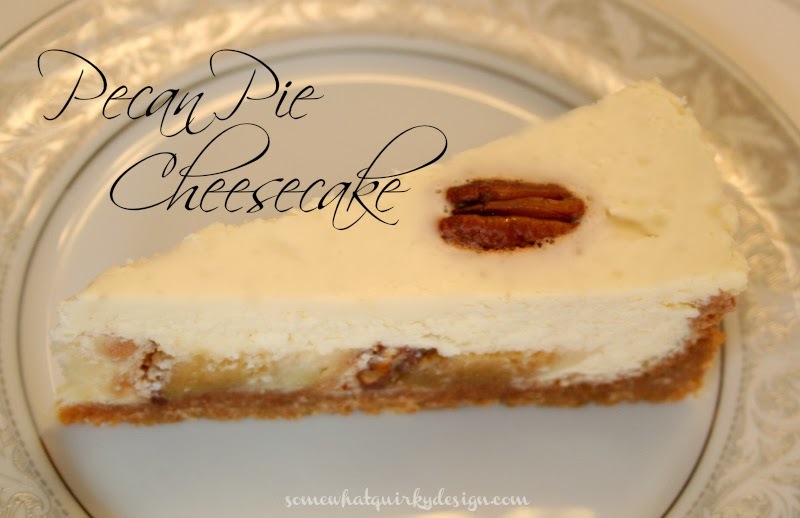 Carefully pour cream cheese mixture evenly over the pecan pie/crust. 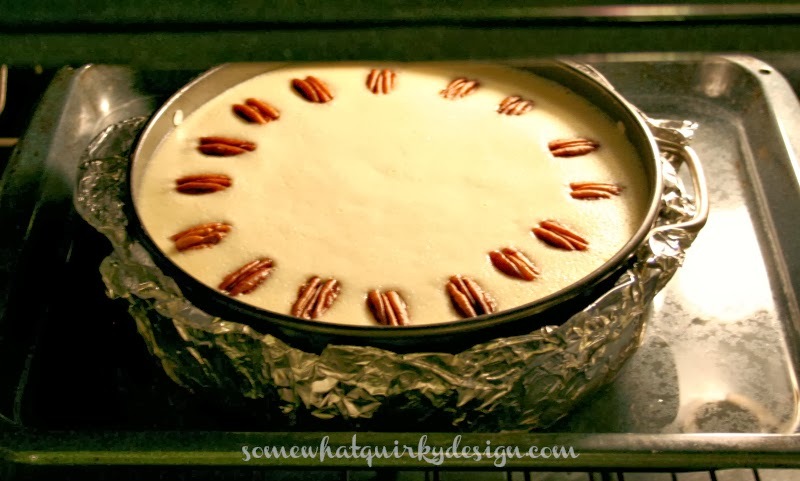 Arrange pecan halves evenly around edge of cheesecake. Bake at 325 for 45 to 50 minutes. 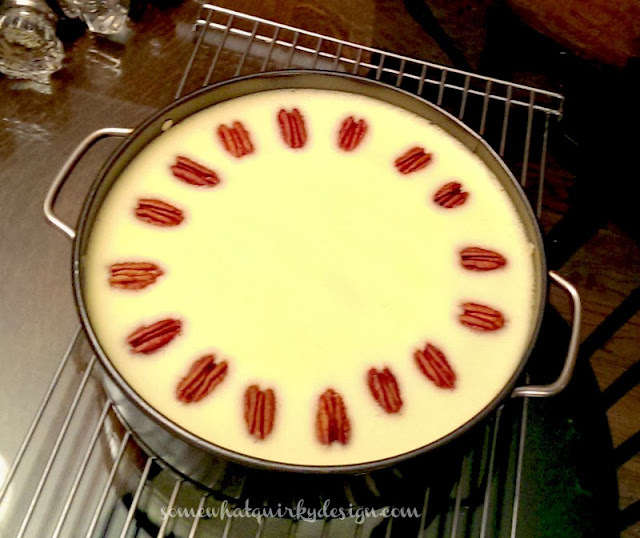 Turn off oven, and let cheesecake stand in oven 1 hour. Remove to a wire rack, and cool completely. Chill at least 8 hours or overnight before serving. I use a water bath when I make cheesecake. It's just better that way. It sounds fancy but it is easy. 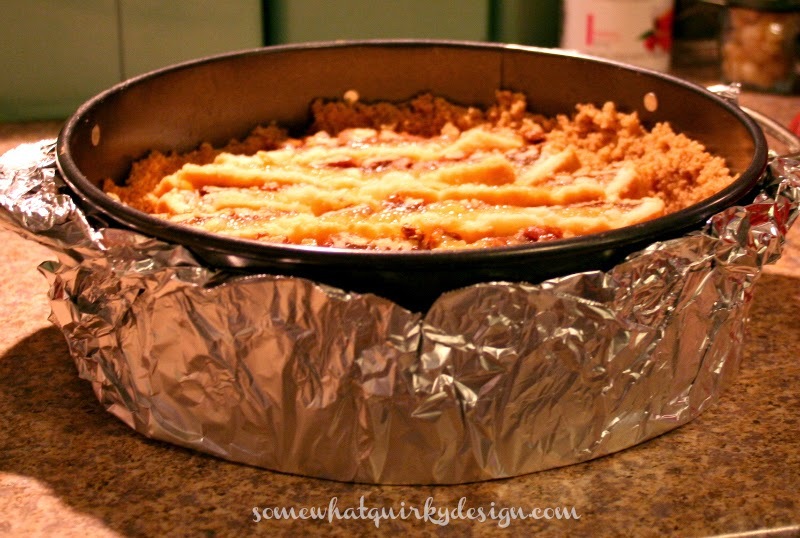 Just wrap your springform pan in one or two layers of foil. When you turn your oven on to preheat, put 2 or 3 inches of hot tap water into a large pan - I use my broiler pan. Place the filled pan into this pan of water to cook. Easy huh? It will keep your cake from cracking and keep a better texture while it cooks. This picture I took while it was cooling is unfortunately the only one I have of the whole cake. I don't know how that rather neon color got on this picture, but rest assured that this will not happen to your cheesecake. I hate cell phone pics. Oh Oh Oh! I forgot to mention that I adapted (only slightly) this recipe from Southern Living's 40 Year of Our Best Recipes. My favorite cookbook ever. It is good. Very good. Lots and lots of good recipes. Very good recipes. Buy it. It's published by Oxmoor House. It does look delicious and I'm kind of fascinated by the fact that it has actual pie in it! Yummm! Well I pinned it, dammmit. Oh, I would love to make this. My daughter won't eat a thing with nuts in it. Maybe I'll make it for Christmas for my other daughter. Pecan pie is my favorite and this looks so tempting.